“BBC, ITV and Sky have today written to the leaders of the Labour, Conservative and Liberal Democrat parties with a joint proposal for three live televised debates during the next general election campaign. “The individual broadcasters would be responsible for producing and broadcasting one debate each between all three party leaders. “Each of the three debates would be transmitted live by the originating broadcaster in peak time and made available to all other British broadcasters subsequently. “The broadcasters have formed a joint team to discuss detailed plans with the political parties. This entry was posted in Broadcasting, Media releases and tagged BBC, ITV, live debate, Sky on October 2, 2009 by Judith Townend. This entry was posted in Broadcasting, Multimedia and tagged BBC, Channel 4 News, DEC, Disasters Emergency Committee, Gaza, ITN, Sky on January 26, 2009 by John Thompson. Sky’s new online-only subscription TV service, Sky Player TV, has been launched, according to DigitalSpy.co.uk. The service, announced last month, offers three subscription packages featuring a mixture of live and on demand programming. This entry was posted in Broadcasting, Editors' pick and tagged DigitalSpy.co.uk, Sky, Sky Player, Sky Player TV on December 8, 2008 by Judith Townend. So that’s the Georgia between sandwiched between Europe and Asia and not the US state then? 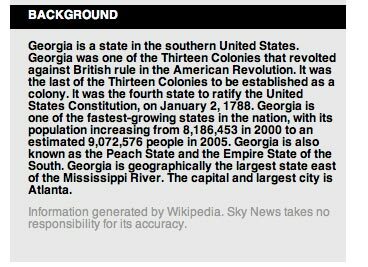 If you’re going to use Wikipedia, at least get the right entry. Thank goodness for the disclaimer… it’s no one’s fault! This entry was posted in Online Journalism and tagged Asia, Europe, Funny, Georgia, online section, Russia, Sky, Sky News, United States on August 11, 2008 by Laura Oliver. Channel director Cassy will take a six-month secondment to develop the WSJ’s online video strategy. This entry was posted in Editors' pick and tagged John Cassy, online video Channel director, online video strategy, Sky, USA, Video, Wall Street Journal on July 10, 2008 by Laura Oliver. 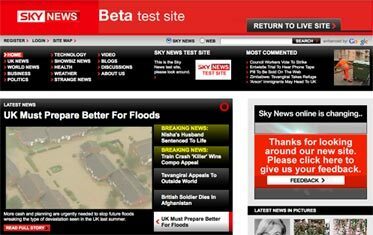 Sky News has launched a beta version of its new website, to run in parallel with its existing news site. It has adopted a top story carousel for the homepage that displays the latest breaking news in video and pictures. It has also added a story tracker in the right column, which lets you follow a story as it develops, and in the left column a See Your News personalisation feature. “What you are visiting is very much work in progress. We are testing and trialling new features and a very different design,” Steve Bennedik, editor of Sky News Networked Media, wrote on his blog. This entry was posted in Editors' pick and tagged beta site, editor, news site, Sky, Sky News, Sky News Networked Media, Steve Bennedik on June 25, 2008 by Oliver Luft.